Triple scissor lift table system used with a chain conveyor mounted both above floor and below floor level for right angle transfer of school buses. 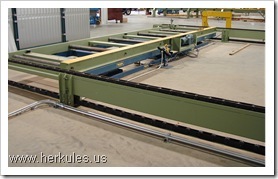 This right angle transfer scissor lift table conveyor application utilizes many of the features of the Herkules pneumatic lift tables. 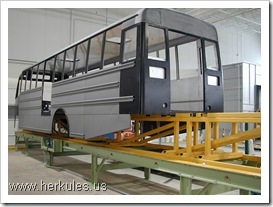 The right angle transfer lift system was placed in the body shop department of the assembly line of the buses. It is important to not have any contaminants such as oil or silica used in the lifting mechanism. These types of materials effect quality of paint coatings. 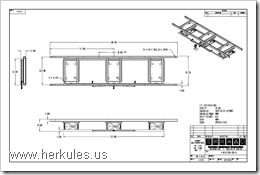 Because of this Thomas Built Bus asked Herkules to manufacture a 100% air operated scissor lift table system for use with the conveyor assembly line. As mentioned the scissor lift tables are used in the paint booth and they raise and lower all the various sizes of busses, the largest beginning at 20,000 pounds (9072 kg) which included a full length skid with one bus. The lift system moves the busses up and down to transfer them from the chain conveyor at 90 degrees to the main conveyor. The lifts cycle full up to pick up a skid and bus then transfer it 90 degrees across to the other paint line. Once it reaches the other paint line, approximately 100 ft (30.5m) away, another lift lowers the skid and bus to the paint line. Then the skid and bus travels back in the direction it came from so additional processing can take place. The right angle transfer scissor lift table conveyor system cycle speed is 5 seconds up and 5 seconds down. The lift is automated to cycle by proximity switches that sense the position of the lift table. The paint conveyor line utilizes bar codes on the skid for identifying the school bus style and position with in the factory. The scissor lift table conveyor is designed to work with the small bus frame that holds 30 passengers up to the larger bus frame that holds 90 passengers. 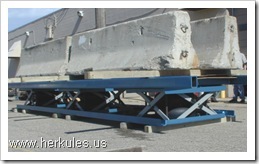 Contact Herkules for all your scissor lift table conveyor needs. Our engineers can design a lift system to meet your specific application. This entry was posted in Lift Table Projects and tagged Right Angle Transfer Scissor Lift Table Conveyor by adminenkon. Bookmark the permalink.